One of the charms of the Golden Globes (besides the free-flowing alcohol and usually superior host choices) is the HFPA's recognition of *actual* comedy movies. Recent-ish nominees and winners have included Borat, The Hangover, and Bridesmaids. (Never you mind that The Tourist, Red, and Burlesque were all recently nominated... in the same year.) This year, that is not the case -- and I can't say I'm complaining. While none of the five Best Comedy/Musical nominees are actual comedies (or musicals, thank god), they are all excellent films well worthy of Oscar nominations themselves. (At least, I'm assuming they all are -- I have not yet seen Her.) In fact, I'd argue that the Comedy/Musical field is better top-to-bottom than the very top-heavy Drama field, which should make for a very interesting and unpredictable ceremony -- and one that should have even less correlation to the Oscars than usual. But it also means I have absolutely no idea what I'm doing with these predictions. So this should be fun! Let's dig in. Logic: This one will come down to Lawrence and Nyong'o, and the winner will either confirm or debunk a long-held supposition about the Hollywood Foreign Press Association -- that they are wowed by star power. If that's true, Lawrence would be a shoo-in and Roberts could be considered a dark horse. But they have also been known to nominate and award relative unknowns -- just look at this category back in 2011. This year, I think they'll go with the superior performance in Nyong'o. Hers was one of the best of the year regardless of gender or screen time, heart-wrenching and powerful. Lawrence was fine as yet another manic-depressive dream girl in Russell's film, but was not nearly in the same class as Nyong'o. Ditto Squibb and her profane, charming performance as Bruce Dern's wife. I obviously have not seen Roberts's or Hawkins's performances, but they don't figure to have a chance here. Logic: We'll know a lot about 12 Years a Slave's chances in the Best Drama category after these two awards are announced. If Nyong'o and Fassbender sweep, it would signal a likely win. If only one or neither are awarded, it might not be the film's night. This award could also have a big impact on the Best Actor – Drama race, where 12 Years will once again square off with Dallas. But more on that later. In this category, I think the gender-bending, deeply sympathetic performance of Leto will win out over the visceral, deeply misanthropic character work of Fassbender. Fassbender is responsible for many of the hardest to watch parts of a hard to watch movie, and I'm not sure a body like the HFPA will award a performance like that. Leto, on the other hand, is a star of screen and stage (with his terrible band) and would be an easy box to tick off on the ballot. Cooper was solid but not spectacular in Hustle, but there is no award for best perm. Abdi is so good in Phillips that I actually thought the filmmakers hired an actual Somali pirate. He could be an interesting option at the Oscars, but not here. I haven't seen Bruhl's film, but he's the least likely winner here anyway. Logic: Although most of the nominees are very well-liked, it would be a big upset if anyone but Adams won this award. Delpy and Gerwig both co-wrote their (well-regarded) movies, but their stars don't shine as bright as the others'. Louis-Dreyfuss is a double nominee this year (also for Veep) and can work a room about as well as anyone. You can never count Streep out of any awards race, but no one is talking about her movie and it just doesn't seem to be her year. That leaves Adams, who was the standout among Hustle's excellent ensemble. The wavering English accent, the romantic scheming, and, of course, the sideboob -- she had it all. As a sidenote, however, my favorite performance of the bunch is Gerwig's. Her eponymous Frances Halladay is is hilarious, sympathetic, and has some of the best lines of the year. Check on the film on Netflix streaming if you haven't already. Logic: I'm by no means as certain about this category as I am about Adams above, but I have a hard time envisioning anyone but DiCaprio winning here. He's the biggest star with the meatiest, flashiest role of the bunch. Although some have questions about whether or not the film glorifies Jordan Belfort (I am not in this camp -- the movie plays like a more slapstick American Psycho), it can't be denied that DiCaprio put his all into the role. My next favorite and perhaps a dark horse is Isaac, whose Lleywn Davis is a rolling stone that cant' get out of its own way. There's something soulful in his work, even as his character does his best to be unlikeable. Probably the best of the bunch though is Dern -- his Woody Grant is another unlikeable -- but not unsympathetic -- character, weary and raspy but perhaps too subtle. He's another one with a better shot at the Oscars. Bale is the weak link here as a paunchy con artist -- and very much the straight man amidst three more livewire performances -- but the HFPA seems to really like the movie. I can't wait to see Her -- Phoenix is capable of perhaps the best work of anyone not named Daniel Day-Lewis. 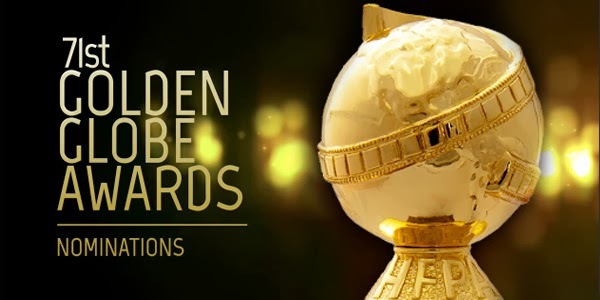 That said, the movie seems a bit small to have a shot at the Globes. Bold: From everything I've read, this award is Blanchett's to lose. I will absolutely see the film before the Oscars, but for now all I can say is that she fits the profile -- foreign-born, respected veteran, and previous winner. Bullock is very much a threat here though -- her one-woman show in Gravity is very awards-friendly and, well, very good and a worthy potential winner. These two should provide an entertaining race at the Oscars. Dench is fine in Philomena, but the film is something of a trifle. (She's also in the same category as Streep though in that you can't really ever count her out.) I have not seen the other two performances, but I can't imagine a scenario where either of them wins, especially Winslet. Man, did the buzz for that movie die quickly. I still haven't brought myself to see Thompson's movie, but I guess I'll have to if she makes her way into the Oscar race. Logic: Man, it seems like 12 Years a Slave and American Hustle are heading for a big-time Oscar showdown. Are these the two front-runners right now (along with Gravity)? More on that in future posts. I could be putting too many eggs in the slavery basket (ugh... I'm sorry about that one, haha), but I think it wins out over Russell and Singer's script at this point in a clear case of substance over style. The opposite would absolutely not surprise me though. I doubt the HFPA will be looking at it this way, but while the Hustle script comes together very nicely in the third act and has some very well-drawn characters (especially Jeremy Renner's), it's also very voice-over heavy and some of the dialogue is a bit on the nose. Ridley's script is functional for the most part, but punctuated by some truly affecting, emotionally explosive scenes. Nelson's script has a great premise, but the actors make that movie, not the writing. I can't for the life of me figure out why the Philomena script was nominated other than the fact that it's British. (This year's ceremony seems a bit like BAFTA 2.0.) There are some nice moments, but it is altogether too cloying and full of unearned payoffs. If the HFPA was going to award Her, it would be here. More when I see the film. Logic: This is a strong group. It wouldn't surprise me if this were the final five for the Oscars -- although Scorsese, the Coens, and even Spike Jonze could sneak in. Of these five, Greengrass and Payne are the low men on the totem pole. Both did fine work -- Phillips is one of the tightest action movies in recent memory and I really liked Nebraska's spare style. But they're both probably out here. Russell could be a spoiler. He's on a bit of a hot streak with his last three films receiving Globes nominations, but the film will be rewarded elsewhere and the other two seem like stronger candidates. McQueen is absolutely a contender, but I think the very trait that marks his direction works against him here. 12 Years is very uncompromising and difficult to watch at times. This works in the actors' favor, but I think it will miss out on the big awards because of it. That leaves Cuarón, whose invisible hand is present in every second of Gravity. It's big, it's showy, it's populist, and it is a stunning technical achievement -- the exact same formula James Cameron used to win here for Avatar. Let's just hope Cuarón's victory speech is less smug than Cameron's though. Logic: Other than maybe Amy Adams, this is the pick I'm most confident in. Llewyn Davis and Nebraska are too quiet, Her is too small, and Wolf is too long and too divisive to win here. It's my least favorite of the four that I've seen, but American Hustle has the cast, the Hollywood sheen, the charm, and the buzz needed to snag this prize. I do like the movie, but David O. Russell movies have offered diminishing returns since Three Kings, his best film. (Really.) Wolf is my favorite (the quaaludes scene! Jonah Hill's veneers! ), and Llewyn Davis and Nebraska have both settled nicely toward the back end of my best films of the year list. I'm sure I'll have more to say once I've seen Her and once these movies all (likely) score Best Picture noms, but for now, American Hustle is just the piece of entertainment that usually wins here. Logic: I pretty much explained this one in the Best Director category -- Gravity is the populist crowd-pleaser while 12 Years is the serious critical darling. I don't see any of the other films as having a chance. Phillips is a worthy nominee, but is a tier lower than the other two. Philomena (really?) and Rush are just filler. I'm surprised Dallas Buyers Club didn't get nominated here, or that there was no room for, I dunno, The Great Gatsby or The Secret Life of Walter Mitty. A film like Mud never had a chance here, but would definitely belong. Regardless, these two films along with American Hustle will make for an intriguing Oscar race in the coming weeks. Due to a tweak in the Oscar schedule, we won't even know the Oscar nominees until the Globe winners are announced -- usually we'd know the nominees by now. I'm looking forward to the race. More comments when the nominees are announced next week. TV Notes: I don't keep up with television nearly as much as I do with film, but I'll be rooting for anything to do with Breaking Bad, as well as Arrested Development, House of Cards, and Orange Is the New Black.